In this article we will discuss about the features and the specifications of the latest Samsung Galaxy Note and Apple iPhone 4S. Here the specifications and features of the two phones are revealed along with the comparison at end. Both the device have somewhat similar features but going into detailed analysis we can get an idea and can take our own decision which smartphone is better in price and technical specifications. Now let us take a look at the features of the two phones. 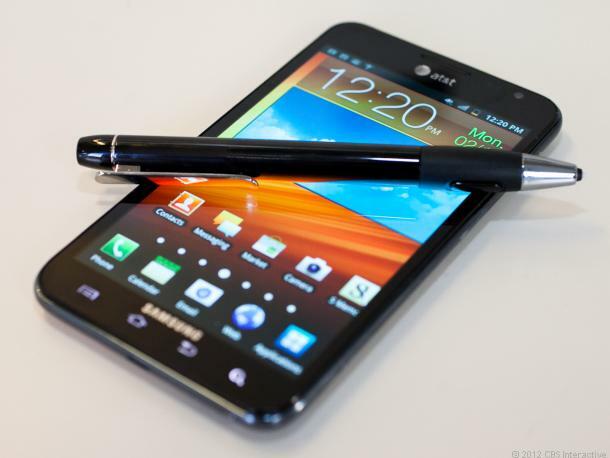 Samsung Galaxy Note is the great tablet of Samsung that has been released in 2012. Samsung Galaxy Note comprises of Super AMOLED capacitive touchscreen and runs on Android OS, v2.3.5 (Gingerbread), upgradable to v4.1. It is easy to use due to its salient features and since it runs over Dual-core 1.4 GHz ARM Cortex-A9 processor. It has an internal memory of 16GB/32GB storage. Actually iPhone doesn't have an external memory but the Samsung Galaxy Note supports an external memory card or microSD card which can be expanded upto 32GB. Almost all the audio and video formats are supported in this smart device and while considerig the camera features. The smart device has a primary camera of 8MP in which high quality pictures can be taken featured by auto-focusing and LED flashlight. Additional features in the camera like touch focus, geo-tagging, face and smile detection makes the mobile mind blowing. The secondary camera is of 2MP which is usually used for Video Calling. Marvelous video capturing is made by the phone. HD videos can be captured using the primary camera at 1080p@30fps. . This phone also supports 4G,3G, 2G, Wi-Fi, Bluetooth v4.0 with A2DP, GPS, microUSB 2.0, GPRS, EDGE. The phone also supports NFC. It supports Java applications with the help of Java MIDP emulator. External memory expandable upto 32GB. 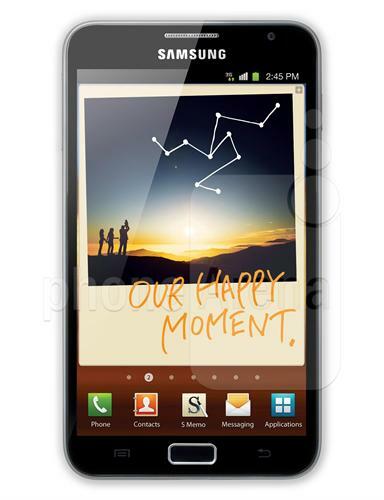 8 MP primary camera with face and smile detection and touch focus feature. 2 MP secondary camera for video calling facility. Uses standard battery, Li-Ion Up to 960 h (2G) / Up to 820 h (3G) standby and Up to 26 h 10 min (2G) / Up to 13 h 30 min (3G) talktime. Supports 2G, 3G, 4G, GPRS, Edge, Wi-Fi, Bluetooth, GPS, USB, NFC. 4.8 inch sized Super AMOLED capacitive touchscreen with 16M colors is used in this phone. It comes with a 16M true color display with 800 x 1280 pixels. Phone features multi touch facility. Corning Gorilla glass is used for the screen protection. The phone comes with dual camera. Primary one is of 8 MP camera with LED flashlight and auto focus featured by Geo-tagging, face and smile detection and touch focus facility. It also supports HD video recording 1080p@24~30fps. Secondary camera is of 2MP, 750p@30fps. New generation Android OS is used. The phone supports the Android OS, v2.3.5 (Gingerbread), upgradable to v4.1 with Exynos chiplet is used. A new multimedia technology is used here, so the application are more faster. It comprises of preloaded necessary applications. This mobile functions at high speed, since it has an inbuilt memory of 16/32/64GB and it runs over Exynos 4412 Quad-core 1.4 GHz Cortex-A9 processor and 1GB RAM. The phone supports microSD card which expandable upto 32GB. The Samsung Galaxy Note has the latest connectivity features in it. It supports 2G, 3G, 4G, GPRS, Edge, Wi-Fi, Bluetooth v4.0, GPS, USB 2.0, NFC. It uses a powerful battery of Li-Ion 2500 mAh. The phone gives a Talk time up to Up to 26 h 10 min (2G) / Up to 13 h 30 min (3G) and gives a standby time up to Up to 960 h (2G) / Up to 820 h (3G). The phone uses sensors for Accelerometer, gyro, proximity, compass, barometer. Java application works on this phone using Java MIDP emulator. The phone comes with the colours Pebble blue, Marble white, Amber brown, Garnet red, Sapphire black, Titanium grey. The phone comes with some inbuilt apps. A lot of applications can be downloaded from the Android market. The Apple iPhone 4S comprises of LED-backlit IPS TFT, capacitive touchscreen with 16M colors and runs on operating system Apple's iOS 5, upgradable to iOS 6.0 which is the unique OS of the iPhone. It is more easy to use due to its amazing features and it has a good speed of functioning, since it runs over Apple A6 processor and also have a 512 MB RAM. And the main thing is its internal memory, since iPhone 4s doesn't have an external one, i.e, it doesn't supports an external memory card or microSD card. So the phone contains an internal memory of 16/32/64 GB storage. While considering the camera features the phone comes with dual cameras ie, primary one and secondary one. Primary is one with 8 MP (3264x2448 pixels) in which high quality pictures can be taken featured by auto-focusing and LED flashlight. Additional features in the camera like touch focus, geo-tagging, face detection, panorama, HDR makes the Mobile Phones mind blowing. The secondary is of VGA camera with 480p@30fps which is usually used for Video Calling over the range Wi-Fi, 3G,4G. Marvellous video capturing is made by the phone. HD videos can be captured using the primary camera on 1080p@30fps. This phone also supports 4G,3G, 2G, Wi-Fi, Bluetooth v4.0 with A2DP, GPS, microUSB 2.0, GPRS, EDGE. One thing that we can say as a defect is it only uses micro SIM to operate. Uses standard Li-Po battery with up-to 225 hours(2G) / 225hours(3G) standby and 8 hours (2G) / 8 hours (3G) talktime and 40 hours of music play. 4.0 inch sized LED-backlit IPS TFT, capacitive touchscreen is used in this phone. It comes with a 16M true color display with 640 x 1136 pixels. Phone features multi touch facility. Corning Gorilla glass and oleophobic coating is used for the screen protection. The phone comes with dual camera. Primary one is of 8 MP camera with LED flashlight and auto focus featured by Geo-tagging, face detection, panorama, HDR and touch focus facility. It also supports HD video recordig 1080p@30fps. Secondary is a VGA camera with 480p@30fps mainly used for video calling over Wi-Fi and 3G/4G. 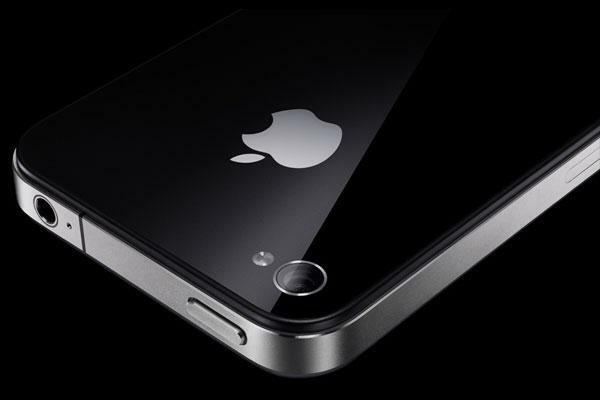 New generation of Apple iPhone Operating system with Apple A5 chipset is used. The phone supports the iOS 6. A new multimedia technology is used here, so the application are more faster. It comprises of preloaded necessary Applications. iPhone 4S functions at high speed, since it has an inbuilt memory of 16/32/64GB and it runs over Apple A6 processor. But the phone doesn't supports microSD card or any external memory. 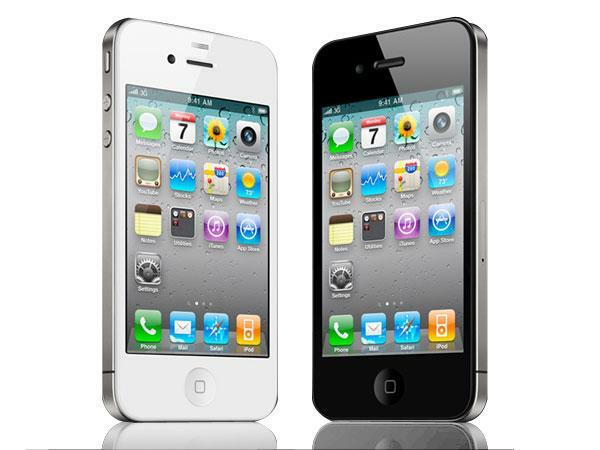 The Apple iPhone 4S have the latest connectivity features in it. It supports 2G, 3G, 4G, GPRS, Edge, Wi-Fi, Bluetooth v4.0, GPS, USB 2.0. It uses a Standard battery, Li-Po 1432 mAh (5.3 Wh). The phone gives a Talk time of 8 hours at 2G and 8 hours at 3G and gives a standby time of 225 hours at 2G and 225 hours at 3G and 40 hours of music play. Only supports micro sim. The phone uses sensors for Accelerometer, gyro, proximity, compass. Active noise cancellation can made with dedicated dual mics. Siri natural language commands and dictation are used. Uses Apple's iCloud service. The phone is comes with some inbuild apps. A lot of applications can be downloaded from the App store. 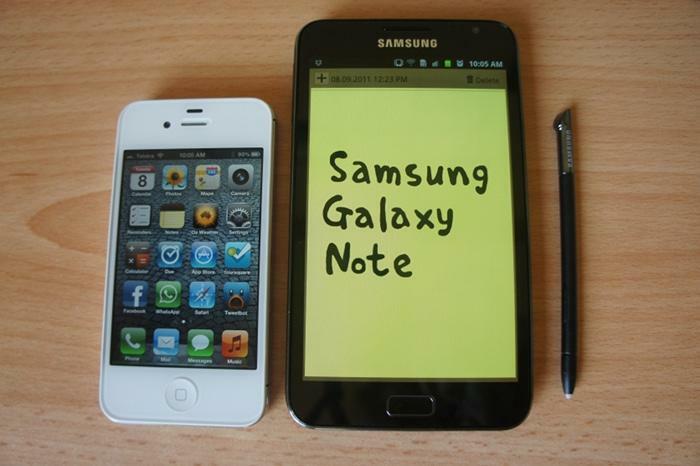 The Samsung Galaxy Note is the one that can compete with the iPhone 4S specification and functions. The arrival of the Samsung Galaxy Note should be a cause for Apple to worry iPhone 4S and Samsung Galaxy Note have almost same features with only a slight variations in it. So this slight variation can also make a big difference in the mobile phone specifications while we compare them. The technology used in the Samsung Galaxy Note screen is called AMOLED touch screen, which can display vivid color and deep blacks. 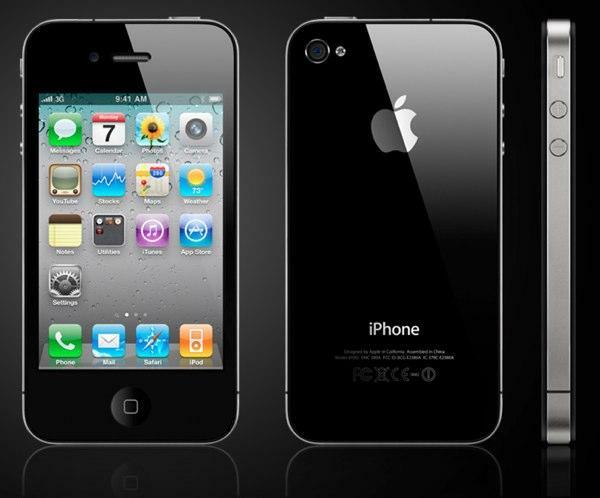 Since the iPhone 4S uses a LCD screen, it can only display light colours better. The camera feature is almost same since both uses 8MP camera, but there is a difference in its secondary camera feature since Samsung Galaxy Note uses a 2MP camera and iPhone 4S uses a VGA camera. The main defect of the iPhone 5 is that it doesn't have an external memory and memory cards cannot be used, but Samsung Galaxy Note is better in that case. It supports external memory expandable upto 64GB. In the name of brand Apple iPhone is better, since customers has a great impression on iPhones. But by considering the technical features and good specification it can be concluded that the Samsung Galaxy Note is much better than Apple iPhone 4S. Are you tried up searching for How to use Siri on iPhone 4S you tube videos. Also videos on how do Siri works on iPhone 4S? Here we will clarify those questions which are being asked by thousands who like to know more about Siri in iPhone 4S. Hope your doubts will be cleared soon. I think that while comparing Apple iphone 4S and Samsung notepad in the brand Apple iPhone is better since most customers has a great impression on iPhones. But by considering the technical features and good specification it can be concluded that the Samsung Galaxy Note is much better than Apple iPhone 4S.